Please note that an inclination angle of 30° is the maximum value for this special accessory in grade 8. 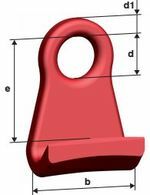 The hook is perfect for lifting and transporting barrels. To do this, two hooks are attached to chain, which contracts under load. Moreover, the barrel hook complies with the pewag factory standard and comes with a full operating manual.